The Disciples were in the middle of a deadly storm on the Sea of Galilee, but they forgot they had someone in the boat who was the Master of the storm. Jesus calmed the storm, but he asked them “Where is your faith?” In the midst of our storms of life Jesus wants us to remember that he is with us in our boat, and to have confidence rather than fear, knowing that he is in control of our life. I was working on a song idea about our sins being covered by the blood of Jesus. God brought to mind a sermon I had heard a young man preach many years ago in which he used the illustration of God looking at our record and not being able to read any of our sins because something red was all over the page. Praise God that our sins can not be held against us, because they are covered by blood of Jesus! He said "I’ll lift your every burden and your every need supply"
I remember hearing the exclamation “God is Still in Business” in the old-time country churches when there was a testimony of a dramatic answer to prayer or a life-changing move of God. I wrote this song in the midst of a difficult season as our extended family experienced difficulties, illness, and several deaths. But even in our trials God is still God, His grace is still sufficient, and he faithful if we will turn to him. What a day it will be when we meet around God’s throne! Won’t you make plans to join me there? Revelation 7:9-10 After this I looked and there before me was a great multitude that no one could count, from every nation, tribe, people and language, standing before the throne and in front of the Lamb. They were wearing white robes and were holding palm branches in their hands. And they cried out in a loud voice: salvation belongs to our God, who sits on the throne and to the Lamb. I typically take a few weeks to write a song, but this song came in 45 minutes. It was purely a revelation from above, as I can’t recall hearing any teaching about the symbolism of the seamless robe of Jesus. When we go through a valley experience we may wonder if God has forgotten about us. But just as he placed the river in the valley, so his Spirit will flow in our life in the midst of our darkest experiences and help our faith grow strong as we learn to trust him. As believers we don’t need to tremble in fear, but we should tremble in awe and respect for mighty God who will surely bring a day of judgment. Praise God we can avail ourselves of his mercy and trust in the provision he has made through Jesus Christ! Phillipians 4:19 For my God will supply all your needs according to his riches in Christ Jesus. God wants us to have faith in him for every need, but sometimes our faith is weak. Faith is like a muscle, it grows stronger when it is exercised. And it is exercised when we have needs or go through trials and tribulations. Look at those situations as an opportunity to exercise our faith “muscle” in order for our faith in God to grow. This song is from Matthew 11:28-30 God woke me in the middle of the night and told me to write a song based on this teaching of Jesus. It’s not possible to improve on the words of Jesus, so the chorus and second verse are his words, nearly verbatim. The first verse is added as an encouragement to accept this invitation of Jesus. After writing this song I did a word study of this passage and discovered that every phrase is infused with deep meaning. In the winter of 1996-97 California experienced record flooding. In January a warm rain came, melting the snow pack in the Sierra Nevada mountains. The water level behind Don Pedro dam rose 20 feet in 24 hours, an almost unbelievable event since this is the 6th largest body of water in California. To avoid destruction of the dam they opened the floodgates, causing tremendous flooding below in Modesto and the surrounding area. The home of my wife’s grandmother was filled with 4 feet of muddy water. Eventually the house was condemned and had to be destroyed. We spent an exhausting day in rubber boots salvaging what belongings we could from the mud. That night God woke me up out of a sound sleep and gave me the words “Wonderful Love, Glorious Grace” and the direction to write this song. Even in the midst of disaster and trial (especially in difficult situations) God’s Grace and Love is poured out on us! It’s not the size of our faith, it’s the size of our God! So put your faith to work, whether small or great, praying according to his will, and watch what God will do. Oh dear friends, one day soon this life will be over. If we’ve trusted in Jesus we will be ushered into God’s presence. No more death, no more sorrow, no more pain, no more crying. No sin, no evil; only perfect communion with our wonderful Lord. I can’t wait! 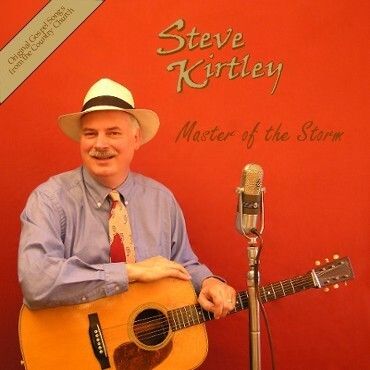 This link will open a new window and take you directly to the Steve Kirtley page on CDBaby.com where you can buy the CD or download the songs. This is our official retail sales partner. CD Baby is the largest on-line seller of independent CDs. They offer secure shopping with all major credit cards and prompt shipping.